A key ingredient that differentiates po boys from other submarine sandwiches is the bread. Louisiana French bread is different from the traditional American baguette, in that it has a flaky crust and a soft, airy center. Our French bread has a crispy crust because the ovens the loaves are baked in are misted with water during the baking process. That moisture serves to make the yeast more active, resulting in a crusty crust. Once a golden color is obtained then oven is opened several times to allow excess steam to escape. The traditional versions are served hot and include fried shrimp and oysters. Soft shell crab, catfish, crawfish, Louisiana hot sausage, roast beef and gravy, and French fries are other common variations. A "dressed" po' boy has lettuce, tomato and mayonnaise; pickles and onion are optional. Non-seafood po' boys will also usually have Mustard, but the customer is expected to specify whether he or she wants "hot" or "regular"—the former being a coarse-grained Creole mustard (such as that produced by Zatarain's) and the latter being American yellow mustard. Mother's Restaurant, a popular lunch stop in New Orleans on Poydras St., uses shredded green cabbage rather than lettuce for its dressed sandwiches. Po Boys were created and served by Benny and Clovis Martin at Martin Brothers Restaurant at 2000 St. Claude Avenue in 1929. The first ones where made with bread dipped in beef gravy and was given away free to out-of-work streetcar drivers out on strike. During the Depression the poboy was made with fried potatoes covered with roast beef gravy. History notes that the cost was 15 cents. 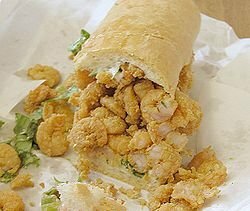 What is a Debris Po-Boy? Muffuletta-Although it is not a po boy the muffuletta is a great New Orleans sandwich.